DEMO stands for Discipleship Evangelism Missional Outreach. We are a department of Andrew Wommack Ministries that is focused on discipling people around the world. Wommack Ministries that is focused on discipling people around the world. Only about 15 percent of those who claim to accept Jesus continue in the faith. What’s the problem? Conversion is a one-time experience; discipleship is a lifelong journey. DEMO is dedicated to discipling pastors so that they can then disciple their communities. In 2018 alone, 3,000 DE course books were printed in Fiji. In the Karamoja region of Uganda, 250 local pastors completed DE, and in South Sudan and Rwanda, 450 pastors began the DE program. Our DE program is currently being used all over the world and has been translated into many languages—with more to come. This gives us the potential to reach approximately 90 percent of the world’s population. Only about 15 percent of those who claim to accept Jesus continue in the faith. What’s the problem? Conversion is a one-time experience; discipleship is a lifelong journey. DEMO is dedicated to discipling pastors so that they can then disciple their communities. In 2018 alone, 3,000 DE course books were printed in Fiji. In the Karamoja region of Uganda, 250 local pastors completed DE, and in South Sudan and Rwanda, 450 pastors began the DE program. Our DE program is currently being used all over the world and has been translated into many languages—with more to come. This gives us the potential to reach approximately 90 percent of the world’s population. DEMO also shows the love of Christ by helping in practical ways and teaching people useful skills that will enable them to be effective “fishers of men” (Matt. 4:19). We do this by providing microfinance training to pastors in Uganda, Rwanda, and South Sudan. In 2018, twenty savings groups were created for churches in Karamoja, and 200 bicycles were given to pastors. DEMO has also provided a number of pastors with backpacks equipped with solar-powered AV equipment for outreaches. These are only a few of the many ways DEMO empowers local church leaders to put into practice all they learn through the DE program. teaching people useful skills that will enable them to be effective “fishers of men” (Matt. 4:19). We do this by providing microfinance training to pastors in Uganda, Rwanda, and South Sudan. In 2018, twenty savings groups were created for churches in Karamoja, and 200 bicycles were given to pastors. DEMO has also provided a number of pastors with backpacks equipped with solar-powered AV equipment for outreaches. These are only a few of the many ways DEMO empowers local church leaders to put into practice all they learn through the DE program. Do you want to fulfill the Great commission but wonder how? 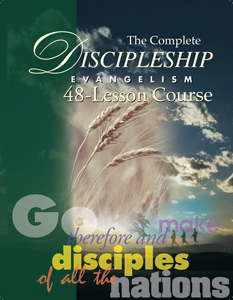 Then explore the free Discipleship Evangelism (DE) course. All available translations can be freely downloaded in PDF format. Select the desired language from the dropdown list to view the file in a new tab. What doth it profit, my brethren, though a man say he hath faith, and have not works? can faith save him? If a brother or sister be naked, and destitute of daily food, And one of you say unto them, Depart in peace, be ye warmed and filled; notwithstanding ye give them not those things which are needful to the body; what doth it profit? Even so faith, if it hath not works, is dead, being alone.... For as the body without the spirit is dead, so faith without works is dead also.